You are here: Home / STARTERS (soup, salad) / Chicken and Rice soup with Avocado: The Best soup when you’re sick! 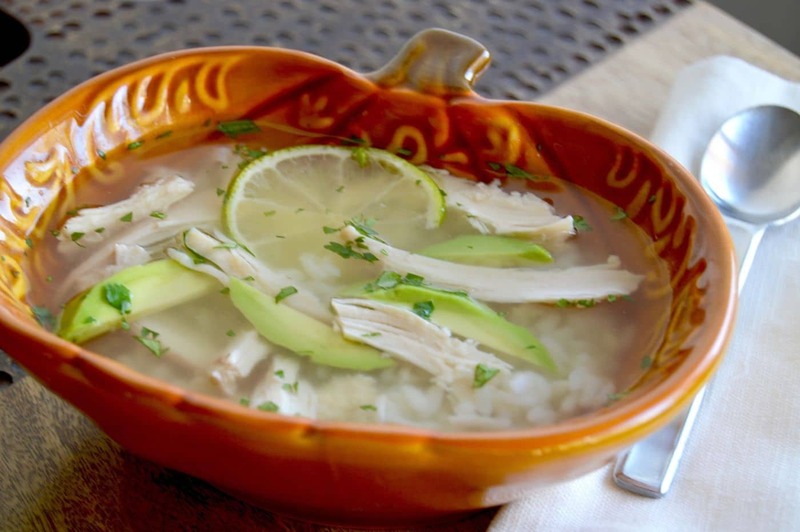 Chicken and Rice soup with Avocado: The Best soup when you’re sick! 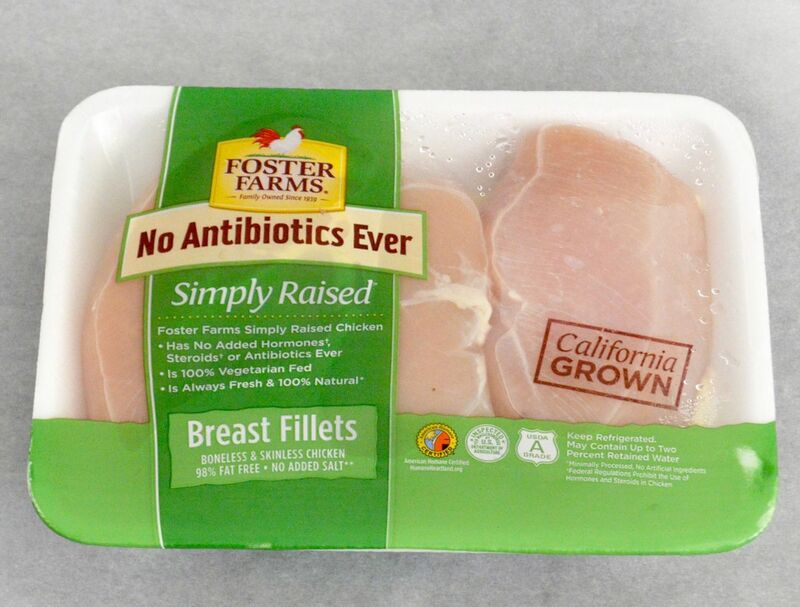 I use Foster Farms Simply Raised Fresh chicken because its raised locally to where its sold and never uses steroids, added hormones or antibiotics EVER in the chicken production. Because the chicken is produced locally I know that it is fresh. What exactly is the definition of a New Comfort Food? 1. Foods that are free of additives, preservatives, antibiotics and hormones. 2. Recipes that are made with local seasonal fresh ingredients. 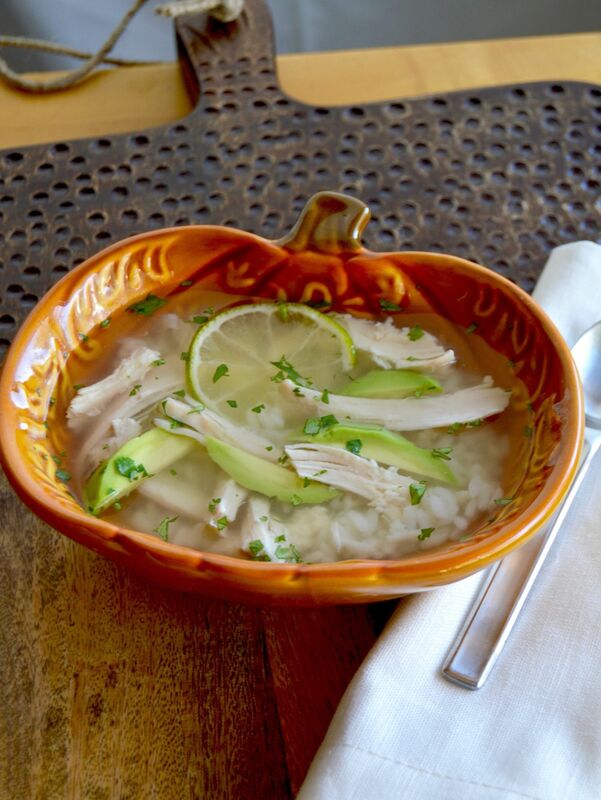 This recipe for Chicken and Rice Soup with Avocado fits the definition of a new comfort food. Its a healthier option than a lot of comfort foods and is made with fresh ingredients in about a half an hour. How can you go wrong with great tasting foods made with just a handful of fresh ingredients in such a short time? 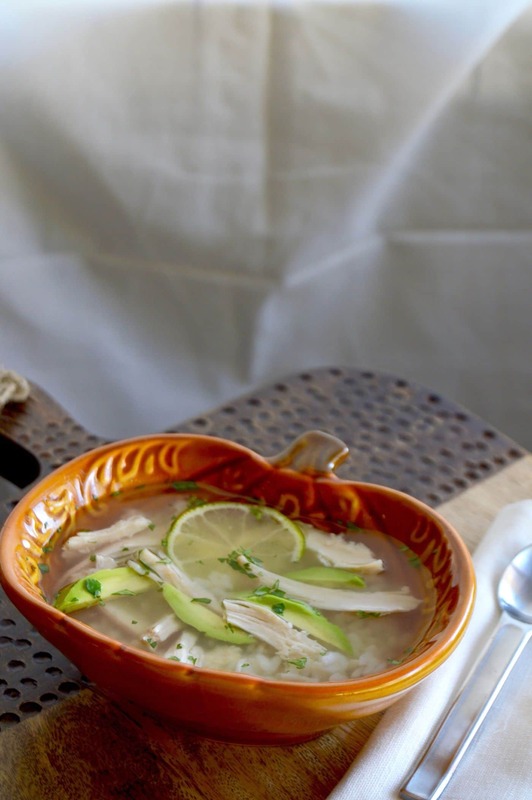 The addition of avocado to the traditional chicken soup adds a smooth creamy bite to your soup. It also makes this soup a great choice for a weeknight dinner that your family will request when they are feeling under the weather AND any time they want a nice bowl of flavorful soup. Easy/Hard: Easy. Less than 20 minutes with a homemade chicken broth? Can’t beat that. Serving Suggestions: Serve with warmed tortillas if you want something a little extra to go with the soup. Optional Add ins: You could add cooked garbanzo beans or some shredded cheese for a nice variation. If you like comfort food soups you may also like this recipe for Ginger Sweet Potato Soup here! Cut each chicken breast into 2 equal pieces. Bring 8 cups of water to boil in a pan that you have a lid for. Once the water is boiling plop the 4 pieces of chicken into the water along with the onion carrot and salt. Cover with a lid, and remove pan to another burner for 20 minutes. While you are poaching the chicken, cut the avocado in half. Remove the pit and slice avocado. Slice limes, and mince cilantro. Once 20 minutes is up, use a slotted spoon to remove and discard onions and carrots. Also remove chicken breast and use a fork to pull chicken to bite sized pieces. Place a small amount of cooked rice in the bottom of each soup bowl. Place a handful of chicken and a few slices of avocado over the top of the rice. Ladle some broth over the top of chicken and rice. Garnish with some minced cilantro and a squeeze of lime juice. Love this! I really liked the avocado in the soup… would never have guessed that would be good. I’ve never had chicken soup with avocado!!! Sounds amazing! What a great soup! I love adding avocado to my soups for the creaminess that it adds along with all those healthy things too! Can’t wait to try this one! I love Foster Farms chicken!! This soup is going on the menu as a cold buster this week. I don’t really think of using avocado in warm dishes for some reason, but I can see how it would absolutely work in this recipe. I also love how clean this dish sounds. This sounds amazing! And I love your pumpkin bowl! This looks sooooo good! I seem to be catching every bug around lately, so I definitely need to cook up a batch of this! And I love that you added avocado, I love to put it in anything and everything! Oooh avocado in soup?? I’ve never had it or thought of it! Sounds super healing, though! Ha! Ha! This reminds me of my trip to the grocery store this morning. I happened to pick up 4 avocados (rock hard ones at that because that is all they had) along with a slew of other groceries. I was shocked at my bills total so when the cashier asked if I wanted my receipt, of course I said “you betcha”. Well…when I got home and took a gander at that receipt, I saw that those four avocados cost $11. $11!!!!! Needless to say. . .I need to find a new source for my avocados because they are a critical part of my diet. And can I say I absolutely adore that you placed them in this warm and comforting. . .chase my cold away. . .chicken noodle soup. Genius!! Soup makes everything better when you’re sick and this soup sounds and looks fantastic! I loved chicken and rice soup when I was a kid, it looks amazing! And I love that bowl! You cant beat a bowl of chicken soup when you are feeling off colour. I like the idea of the avocado being added, I shall have to try that. Love the avocado in there, so much extra flavor! What a great twist on a classic. I love that you added lime, I add lemon juice at the end to freshen it up a bit. This looks great!! I never thought to add avocado in my chicken soup. This sounds so good. This looks delicious! I love chicken and rice soup, so I will be making this soon. I’d happily have this every week, illness in the house or not. This soup sounds delicious, and I just love the clean fresh ingredients. I’d like it whether I was sick or healthy as a horse! This looks amazing! Simple and comforting! And avocado…the best ingredient ever! I live in south Texas on the border, and fresh ripe avocados are always “in season.” This soup looks so good! I’m glad to know about the local aspect of the Foster Farms chicken… That’s always a consideration when I’m shopping! I love that you added avocado. I add it to anything! Can’t ever go wrong with a tasty chicken and rice soup! This sounds wonderful and love the slices of avocado you added. Yum-yum! Wow ! What an amazing recipe. I love chicken soup and is the best during winters.